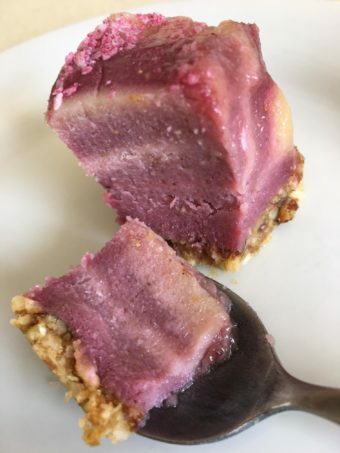 I’d been reading an amazing story about two Epsom-based painter/decorators, Joe Moruzzi and Brendon Parry, who set up a second business selling….. custom-made cheesecakes. Joe started off making cheesecakes for friends and family, set up an Instagram account, and now he and Brendon have 40K followers. 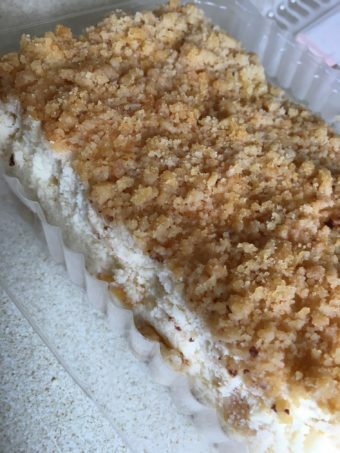 They make the British/American type of cheese cake, with a crushed biscuit and butter case and a filling containing lots of cream cheese and cream. 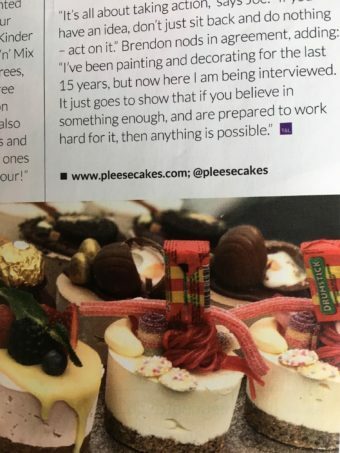 The photos on their website, www.pleesecakes.com, show spectacular toppings: chocolate, toffee, fruit… They’re the official suppliers of weekly cheesecake to the presenter and judges of the TV hit series “The Voice”. 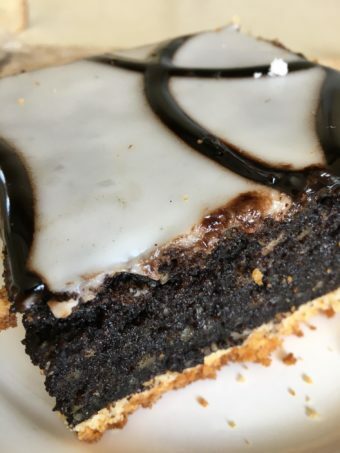 I hadn’t had a chance to try Joe and Brendon’s pleesecakes when I came across a delicious homemade cheesecake in a cosy café called All Things Nice, at 90 High Street, Ewell near Epsom. It was uncooked, with no sugar and no dairy ingredients, and no topping. It was made by the Sutton-based company ripeandnine.com. They make healthy, raw, delicious cakes, and run workshops in Wimbledon. I was a bit skeptical – until I tried the cake. A crumbly biscuit base contrasted with a lovely creamy filling. The lower sugar content gave it an extra fruity taste. The main ingredients were, amazingly, ground cashew nuts, coconut and strawberries. Really yummy and… well, strawberry-y. 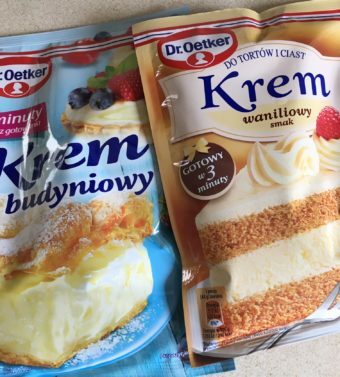 I like all sorts of cheesecake and my favourite is the central/eastern European version. 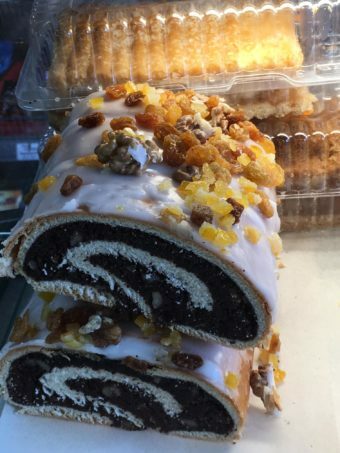 It has a sweet pastry case and the filling contains lots of quark (curd cheese), eggs, and raisins. This cake has a lighter texture than a British/American cheesecake. 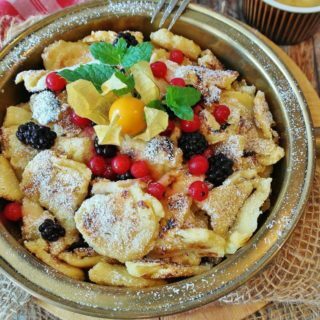 In Germany it’s called Käsekuchen and you can buy it with a sharp-tasting fruit such as cherries or blackcurrants resting on the base. The tart fruit contrasts with the creaminess of the filling. It’s quite different from the richer Käsesahnetorte, which contains a lot more cream, has a milder flavour and a wobblier texture. 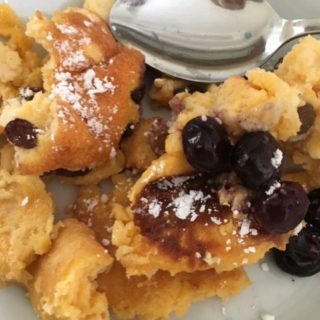 I found a recipe for Kāsekuchen on the internet and added the ingredients to my shopping list. Then I remembered that I’d once eaten this kind of cheesecake in a Polish restaurant in London. My husband had come home late, and found it in the ‘fridge. It’s easy to walk past a Polish shop if, like me, you can’t read Polish. There are no window displays. Perhaps the shop owners assume that if you want to buy Polish food, you know exactly where to come. It gets busy in the evenings when people come home from work. 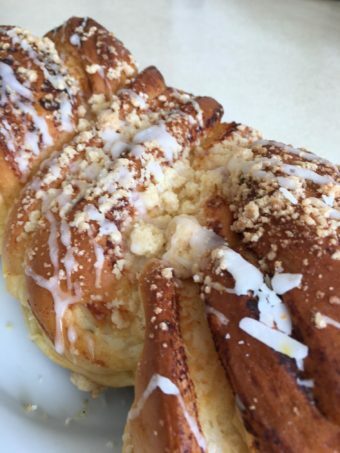 Fresh bread and cakes are delivered every morning and the shop stays open until 8 pm. Here’s a photo of the shop in Worcester Park, so you know what to look out for. You can buy a large slab of fresh Polish cake, several generous servings, for between £5 and £7. They’re all good value. You can’t buy small individual slices. Why would you want to? 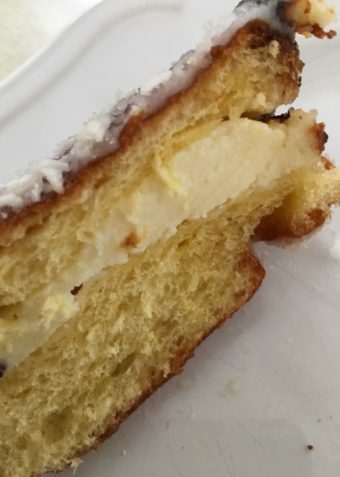 As well as the cheesecake, we bought fresh brioche and a sweet bun with custard filling. The fresh brioche was soft and moist and, my daughter thought, ideal breakfast fodder. Not too sweet and just a drizzle of icing on the top. Talking of custard, I bought two packets of cream mix for decorating and sandwiching cakes, one vanilla and one custard flavour. I’ve never seen these on sale in the UK before – they’re made in Germany. The diagrams on the back of the packets explain what to do: just whisk the powder with the right amount of milk. Dr Oetker promises scrummy results on the packet, so I’ll see what I can do. 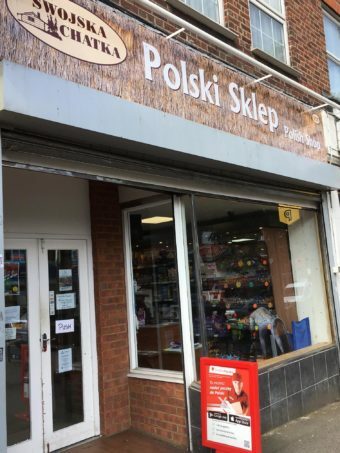 I was told that the larger Polish shops are more like supermarkets, with even more choice, so I tried the one in Sutton, South London. It’s at 271 High Street, with the same fresh morning deliveries and late opening as the Worcester Park shop. I should mention that apart from fresh bread and cakes, Polish shops also stock fresh vegetables, cheeses, a huge range of sausages and all sorts of other foods, as well as Polish magazines. 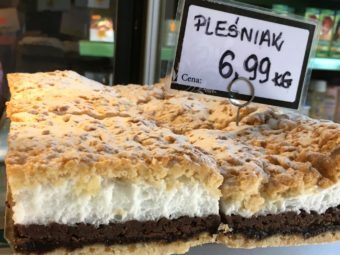 Here are some words and phrases which might come in useful if you want to buy Polish cake. 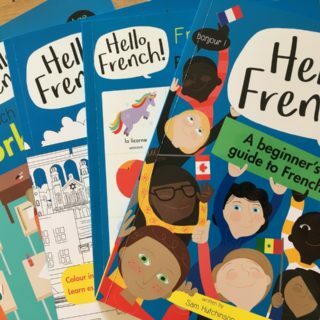 I don’t know how to pronounce them; I’m just listing them so you can identify some of cakes in the cabinet while you’re waiting in the queue. Rozkosz – delight; porzeckowc rozkosz is a blackcurrant or redcurrant delight cake with layers of chocolate, vanilla and fruit. 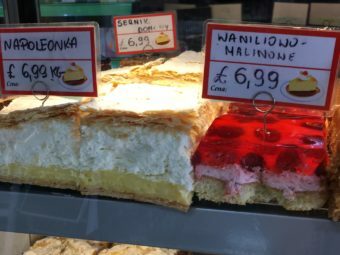 If you want to polish off some Polish cakes (or other Polish foods) which you can’t normally buy in the UK, all you need to do is nip to your nearest Polish shop or supermarket. 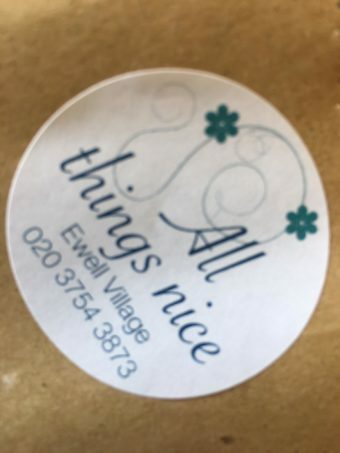 It’s a hidden world in the high street, which I’d known nothing about. 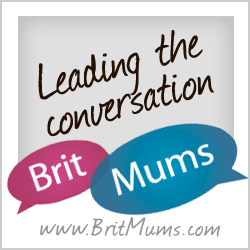 I’d love to hear about your discoveries! Thanks, Jane. 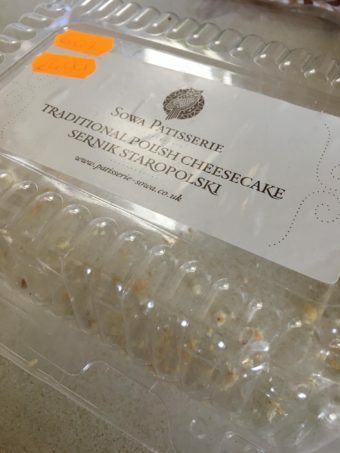 We sometimes buy a delicious Polish cheesecake from our local Polski Sklep – sernik Wiedenski (Viennese style). It’s creamy and delicate with a crunchy base. It is sold with different toppings but the one with a layer of dark chocolate on the top is our favourite- melt in the mouth delicious! Thanks, Sonia, that sounds very good too! 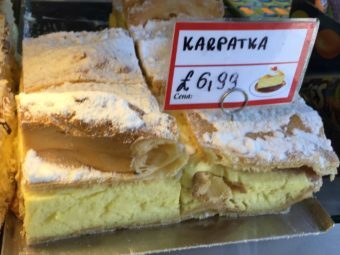 I reckon lots of people are missing out on Polish cakes because they don’t think of going into the shops.